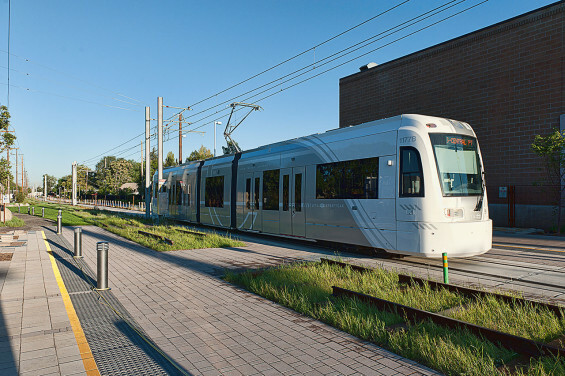 The S-Line is a modern streetcar set in an abandoned 2-mile long freight corridor. 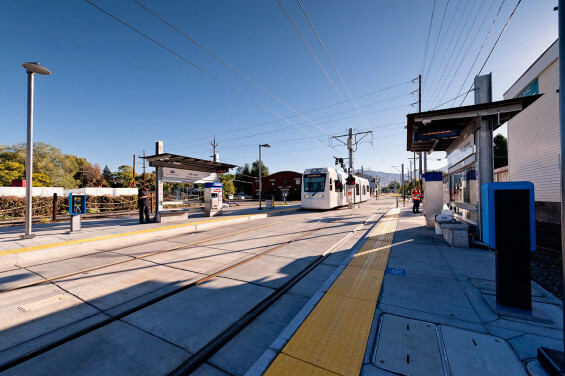 It extends from the existing light rail station in South Salt Lake, through a diverse community of existing neighborhoods, to Salt Lake City’s Sugar House Business District. “The street means more than the building,” wrote planning critic Paul Goldberg. “If you have enough great streets you have one of the most important ingredients of a great city.” The Sugar House Greenway views the street corridor it fills not just as a utilitarian travel route. It views its site as a civic amenity. 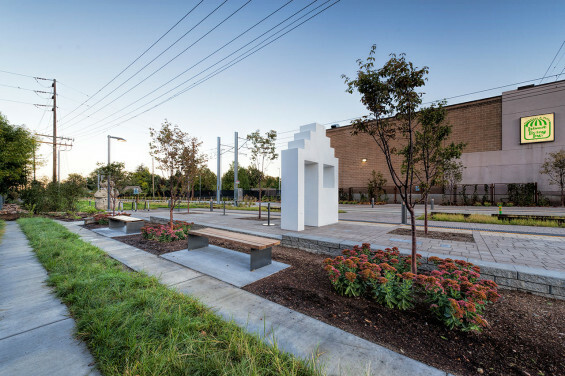 Housed in an old rail corridor, the Greenway is a showcase of urban and landscape design finesse. 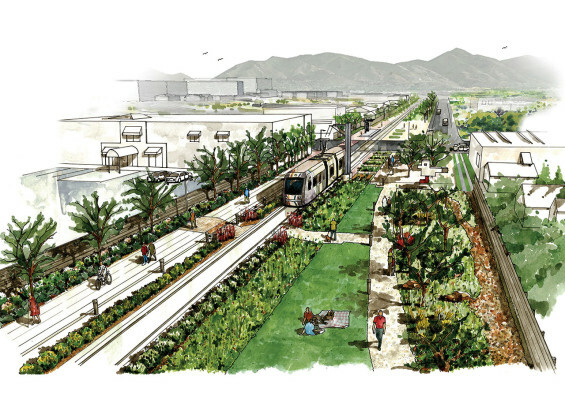 It is structured as a continuous park with segments of greenscape punctuated by plazas at each intersection. 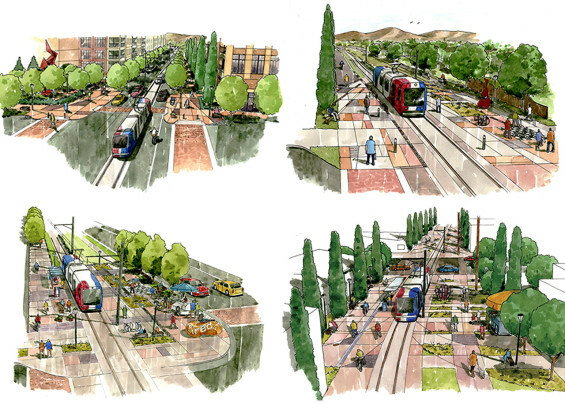 The corridor involves light rail, hardscape plazas and trails, and landscaped green spaces. 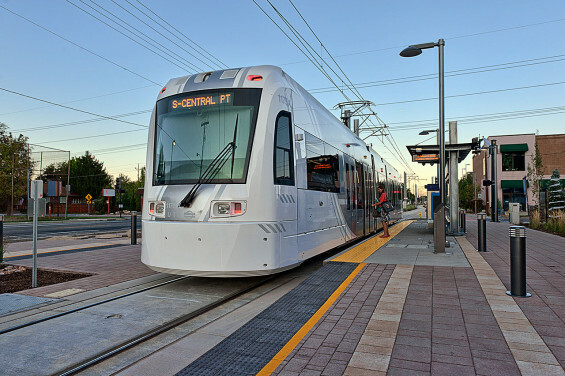 Included are seven stops approximately 0.3 miles apart with service every 15 minutes during peak hours and every 30 minutes during off-peak hours. In 2014 daily ridership is projected to be about 3,000, rising to over 4,000 by 2030. Corridor Dimensions: 2 Miles Long x 66 Feet Wide, 9 Intersections. The Greenway was developed on a bedrock of local support, and in turn, it brings that support back to the community. It is an artery coursing through neighborhoods, businesses, and industries. The S-Line carries the vibrancy of the city into the community, but also brings the strength of community back into the city. 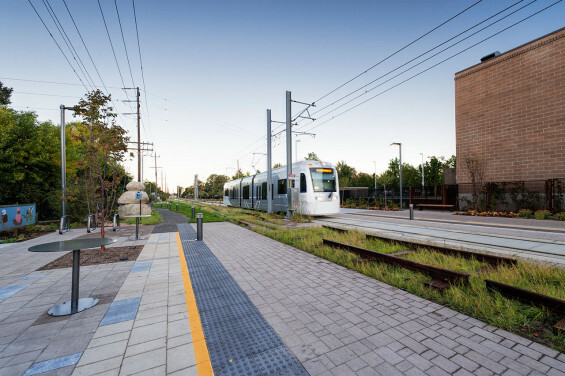 The S-Line Greenway offers a multi-faceted picture of sustainability and growth for the community. Environmentally, it reduces vehicular travel and aids in storm-water retention. Economically, it creates new jobs in itself and carries new buyers to existing businesses. 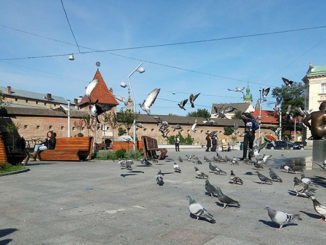 Socially, it creates an inviting public space for community gardens, food vendors, and activities. 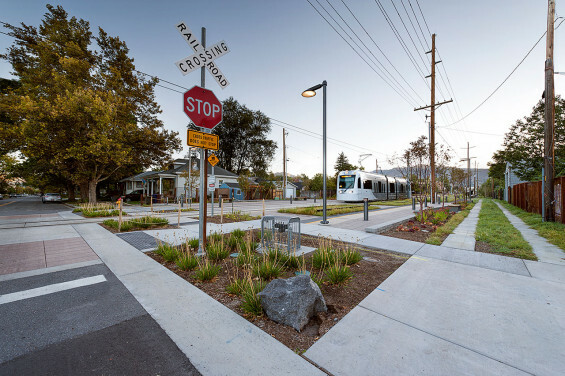 The S Line is a premier and unprecedented multi-modal corridor where streetcar, pedestrian, cyclist and some automobiles share space enhanced by context sensitive landscaping. 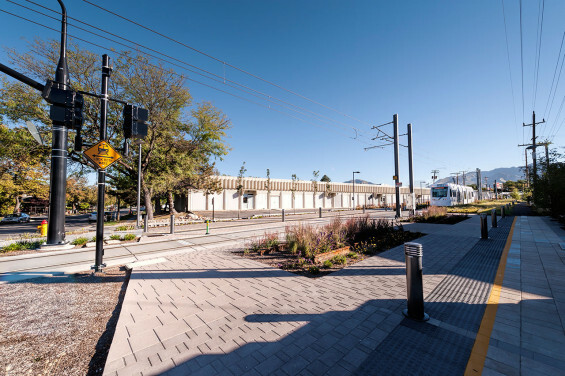 The landscaping of the S Line plays an active role in this corridor by incorporating native and drought tolerant plantings as protective buffers between mobility types. Planting and hardscape elements also act as visual and tactile navigational cues for patrons. 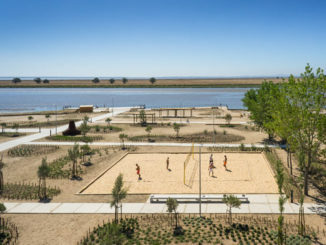 The storm water system of the corridor is an additional feature designed to engage patrons by showing how water can be used to enhance native landscapes here in the arid west. Some of the unique challenges in design and construction the S-Line were managing the interfaces of the various modes of transportation. Because this project was both federally and locally funded, differing and competing design standards were stipulated by three levels of government. Many concessions and compromises were made as the project progressed from its once abandoned state to the actively used corridor it is today. 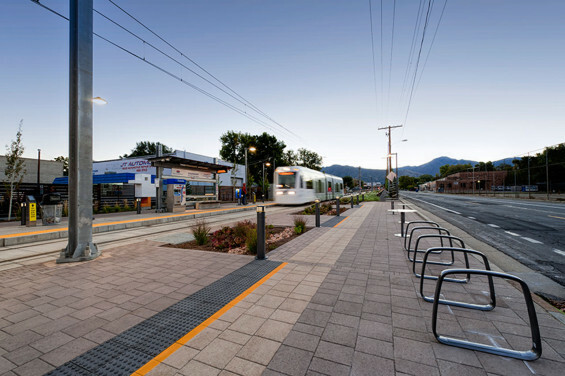 Establishing and designing a safe and active corridor was crucial to the success of this project. All design proposals and changes were viewed and reviewed by several layers of professionals and organizations. From architects to transit managers to building inspectors and contractors, many individuals spent countless hours ensuring a safe and vibrant project. Cost Estimating | Paramterix Inc.